What's New In Sage 100cloud 2019? You are here: Home / Sage 100 ERP / What’s New In Sage 100cloud 2019? Sage 100 and Sage 100cloud version 2019 was released yesterday by Sage ( download here ). 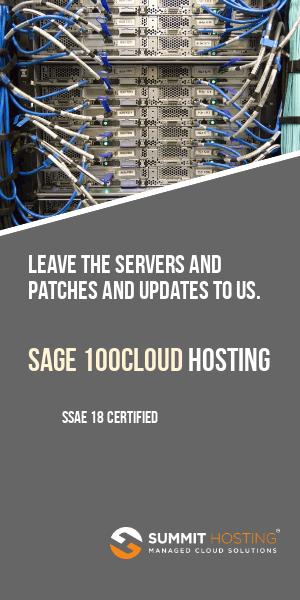 Whether you are on Sage 100 or Sage 100cloud – you use the same installer to upgrade. The product ( Sage 100 vs Sage 100cloud ) is activated when you enter your Sage registration keys. CAUTION: Discuss the installation of any Sage upgrade with your partner or solution provider BEFORE beginning. Any integrations or customizations usually must also be updated at the same time as you upgrade. Recommended Timing: When Should We Install The Sage 100 2019 Upgrade? If you have any enhancements, modifications, scripting or third-party integrations then check with your Sage partner or solution provider before installing any upgrades. In most cases, you cannot install the latest Sage 100 upgrade unless you also upgrade any integrations or customizations which may exist on your system. Important Reminder: If you are using Windows 7 or Windows Server 2008 R2 ( Microsoft support ending for both January 2020 ) then you should update to the latest respective Windows OS prior to upgrading Sage 100. Users of only the core Sage 100 modules with no manufacturing should be comfortable installing Sage 100 beginning installation by May 1, 2019. Schulz Consulting provides on-site Sage 100 consulting to companies located in the Connecticut, New York, Massachusetts, Vermont and Rhode Island area. Whether you are a new user of Sage 100 ( or Sage 100cloud ) or have been using the accounting software for many years – we are available to help. Call us at 833-724-3100 today for more information on how we can assist you with your Sage 100 solution.